The Tennessee Antebellum Trail is a 90 mile looped trail of historic antebellum homes in the heart of middle Tennessee. The homes on the Tennessee Antebellum Trail are open daily for tours. The Trail begins just outside of Nashville and winds through the heart of middle Tennessee, encompassing five communities and eight beautiful antebellum homes and plantations. Spend your days and nights on the Tennessee Antebellum Trail enjoying historical homes, food and shopping. The Tennessee Antebellum Trail is a self-guided tour where you can choose your own itinerary and travel at your leisure. The outcome of the American Revolution wasn’t close to being settled when a group of pioneers crossed the Cumberland River and settled Nashville on Christmas Eve 1770. The Tennessee Territory of North Carolina was exploding with westward expansion. Counties and townships were taking shape and soon log cabins were being replaced by grander plantation-style homes. The first half of the nineteenth century saw increased prosperity for Tennessee, and the families who built the eight mansions featured on the Tennessee Antebellum Trail were certainly no exception. Andrew Jackson became president of the United States in 1829, to be followed twelve years later by another Middle Tennessean, James K. Polk. It was a time of chivalry, Southern hospitality and gracious living with elegant furnishings and imported textiles. It was a time of Southern belles and balls. However, darker days were looming as tensions grew between the North and South. The War of Northern Aggression, as it was often called, was literally fought on the lawns of most of these mansions. Today, many still bear the scars of those long-ago battles. At Carnton Plantation, 1500 Confederate soldiers rest in the private cemetery – a sober reminder of the thousands who lost their lives during the battles of Franklin and Nashville. The spirit that led the pioneers to settle Tennessee in the eighteenth century is the same spirit that guided the families of the nineteenth century to persevere. We invite you to come visit the Tennessee plantation homes from yesteryear and make sure you allow yourself ample time to enjoy your trip. 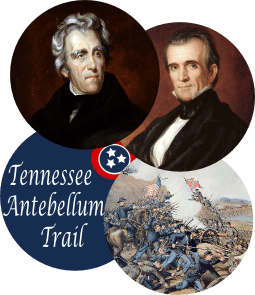 The Tennessee Antebellum Trail is a completely self-guided and self-paced tour so you can visit all the homes and sights on the trail at your leisure. The following sample itineraries are just a guide to help you plan your trip. One of the favorites on the Tennessee Antebellum Trail is the Two Day Tennessee Antebellum Trail Experience, where you tour eight beautiful Antebellum plantation homes while taking a relaxing drive through the beautiful Tennessee countryside. 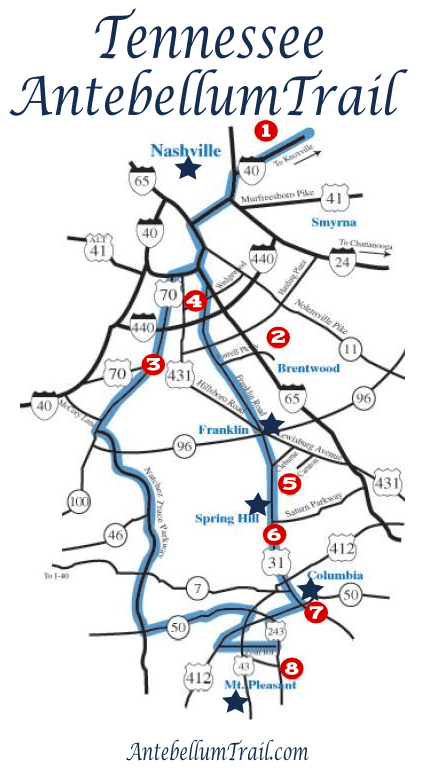 For history loving Civil War enthusiasts, the Tennessee Antebellum Trail Civil War Tour sample itinerary will help guide you along as you go from plantation to battlefield and from cemetery to monument. For all the thrill seeking spooky history fans and fanatics, there is a tour made just for you – the one of a kind Tennessee Antebellum Trail Ghost Tour! Walk The Hermitage mansion and cemetery grounds by lantern. Conduct a paranormal investigation at Rippavilla. Take a candlelit evening cemetery tour in Franklin. If you want ghosts, you can find plenty of them on the Tennessee Antebellum Trail!